This certainly isn’t a new revelation, but when it comes to achieving your healthy eating and fitness goals, consistency is the secret to success. Of course, this is easy to say and at times hard to implement so we thought we might share a secret that has helped to hold us accountable to ourselves- RITUALS! To be more specific, morning rituals are critical to success. While everyone has them- wake up, shower, grab coffee and a convenient breakfast (maybe), etc.- they aren’t always the best options for the start of a productive day. If this sounds like a typical morning for you, ask yourself this- Are these behaviors truly helping me to get where I want to be? Doing so affords us a glimpse at the unseen forces that control our lives. It might by hard to believe but people are controlled by their rituals- good and bad. Here’s a real life example. How many of you wake up and before your feet even hit the floor, have already checked your email? Well, I am sorry to tell you that you have just given up control of your day to your Inbox. What this means is that we are often on autopilot and when you succumb to these forces, oftentimes we are steered in a direction opposite of where we want to be. How does this relate to consistency? Take this morning ritual for example- you wake up, head to the gym for the 6am class, come home to shower, eat a breakfast that you have already prepared for yourself, journal what your grateful for and/or read and then head out to face your day. Sound like a lot? Honestly, you can fit a series of healthy rituals like these into small chunks of time that work for you and your life. When implemented, you have already exercised and nourished your body, mind, and soul- all before work! Do this 3, 4, 5, or more days a week and these behaviors will not only become habit, you will notice a definite change in all aspects of your life. TRYING to be consistent with your healthy habits will become an effortless ritual and ultimately aid in your success. 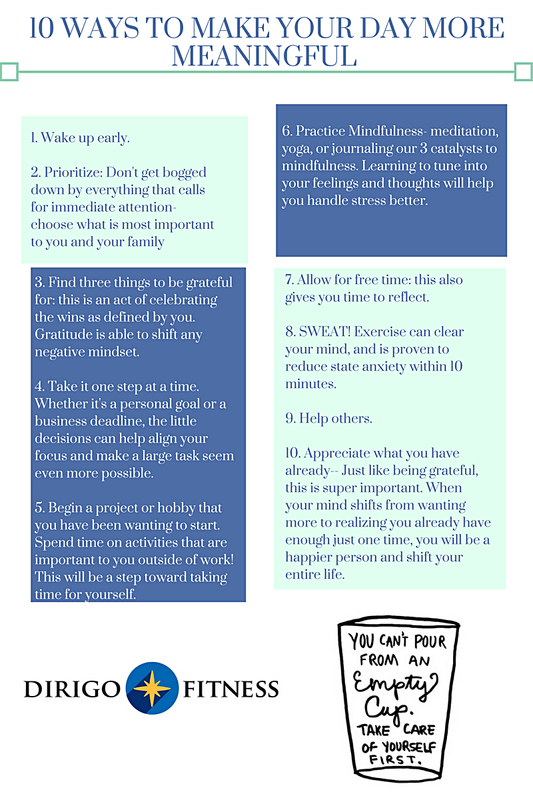 If you are looking for some ideas on how to create a morning ritual of your own, feel free to reach out to us. We are here to help and want to see you succeed in whatever you want to accomplish! If you have been participating in our newly-established nutrition classes this month, then you might be feeling a bit overwhelmed with new information, some pressure to create new habits, or (insert your limiting belief of choice here) about your chances of success. Fortunately, though, nutrition doesn’t have to be an insurmountable, complicated topic. ·Are you chewing your food 32 times? It may sound ridiculous, but this will allow your body to absorb more of your food’s nutrients. ·Are you eating vegetables multiple times per day? ·Are you eating 10 colors of vegetables throughout the week? ·Are you drinking ½ of your body weight, in ounces, of water each day (as a minimum)? ·Are you taking in a consistent amount of protein? ·Are you mixing up your food sources so that you don’t eat the same exact thing each day? Take a few moments and ask yourself, “Where am I at, today?” and go from there. Making minor changes can add up to BIG SUCCESS. Remember- you’ve got this and we are here to help you succeed. Many of us go through the motions of daily life and find that they feel unfulfilled at the end of the day. Why? In a nutshell, we have put ourselves on autopilot and live in a place where our potential to grow essentially dies. You see, developing a bigger sense of yourself, by either facing fears, having difficult conversations or vigorously exercising- for instance- can quickly snap us out of this negative state of being. Actively engaging in activities that challenge our perceived limitations allows us to grow and to feel truly alive. Are you taking advantage of this already? Perhaps it is time to reevaluate your actions. Of course, you might be thinking “This is easier said than done” and yes, unfortunately it is very easy to get tripped-up in a cycle of JUST EXISTING. Where we get stuck most often is in an endless cycle of busyness, chaos, and never feeling completely settled- a place where every day your mental state is the same (stressed/overwhelmed/depressed, etc…) and you drag yourself through your day desperate for relief. What this is my friends is, JUST EXISTING. Do you need a reward for getting through the day? Do you believe that because you worked hard today, that you should be rewarded with (insert any harmful behavior here- overeating and excessive drinking are popular ones). Yes, many of us do this and try to justify why we DESERVE these things but bottom line, we are ultimately hurting ourselves with these behaviors. Aren’t you worth more than that? Don’t you DESERVE to live a meaningful life? If you are not putting yourself in the aforementioned “uncomfortable” situations at least once a week, I’ll argue that you’re just not stretching yourself far enough. Your business, relationship, and parenting abilities (to name a few effected areas) will only grow to the degree that you grow and if you aren’t growing, you’re dying. You are the common denominator in your life.